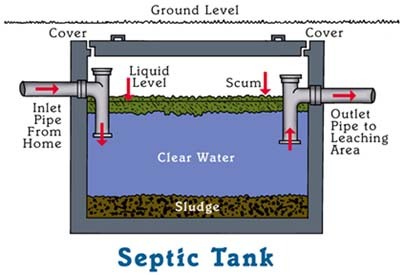 Pump your septic tank regularly! This reduces the sludge available to move into the field. It's best to pump the tank every 1-3 years. The frequency of pumping depends on the amount of sewage produced and the size of the tank. In cases where the disposal field has limited capacity (high ground water, poorly draining soils, small absorption area) or where more waste water is produced (large families, homes with garbage disposals). It is critical to pump more often especially when excessive amounts of bleach and other harsh chemicals are used that kill the bacteria action. Avoid flushing anything that will not break down (i.e. baby wipes, sanitary napkins, q-tips, cigarette butts) these things will float and can get by the outlet device. The less sludge in your tank the better. For more information, please call 1-800-266-0002.